Rain doesn't ruin a love scene. Let the passion turn that water into steam! Dress for the drama and style of the rain slicked city in this fashionably romantic kissing dress up. 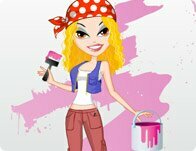 A twist of sass and a dash of heavy-duty tools turn this construction chic gal into a fashion model on the work site. Radiate with confidence as you roll through town on your own custom chopper. Be cool, be tough, be hot. Hey, beautiful, be anything you want. This darling duo has flashy rock style for miles! Go emo, get crunk, and rock out forever with a loving duet sung by 2 best friends forever. When the dead rise they have only fashion on their mind. Ghoulish, gory and gorgeous. This undead fashionista will haunt your dreams with her morbid sense of style and wicked undead smile. She's a psychic with a 6th sense for style. Look into her crystal ball and consult the spirit world for fashion and fun from another dimension! Bugs, dinosaurs, mummies and more await at the science museum. Dress to impress and look your best for all the historical artifacts that await! Enter a world of castles, adventure and exploration! Dress snazzy for these ancient relics and look your best as you uncover secrets of a time gone by! This active young lady is having an amazing time on this windsurfing board. Her stylish equipment must be the reason why. Underwater excursions are always amazing adventures. Especially when you have a cool friend to share it with! Get your aquatic attire and make some fishy friends. This loving pair is so cute! Experiment few appealing looks for them to have a good time. This cute amateur astronomer enjoys watching the night sky. However, she needs your help to understand the science of fashion. 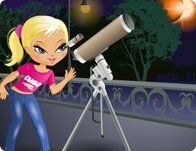 Help her looking amazing for this backyard astronomy activity. People dress in a beautiful manner on the wonderful island of Ibiza. Master a chic and elegant style for this young couple.